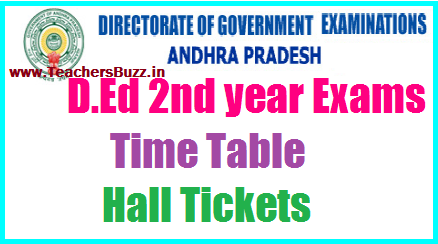 AP D.EL.Ed 2nd Year HallTickets Sep -2018 available to download now : AP D.Ed 2nd Year Exams Dates/ Time Table-Hall Tickets Download 2018, AP D.Ed 2nd Year Examinations for 2015-2018 Batch. DEd 2nd year Hall Tickets, DEd 2nd Year Exams Time Table, AP D.Ed II Year 2018 Annual Exams Schedule, AP D.Ed 2nd year Exams Time Table for Regular and Backlog Batch, AP DEd Second year Public/Special Exams 2018 Time Table, DEd 2nd Year Exams Dates, Hall Tickets of AP DEd 2nd year AP D.Ed Second Year Exams Time Table Download at www.bse.ap.gov.in. AP BSE announced DEd 2nd year Exam Schedule for 2016-2018 batch. D.Ed Second year students Download Hall Tickets at School Education Official website. AP D.Ed 2nd year Regular and Backlog Batch Students Exams 2018. AP D.Ed.IInd year scheduled to be conducted in the month of September 2018 from 10.00 A.M to 1.00 P.M.
Andhra Pradesh Director of Government Examinations Board has announced the D. Ed Second year 2016-2018 batch Exam dates. D.Ed Colleges Second year exams will be conducted in the month of Sept 2018. These schedule is applicable to failed candidates in earlier D.Ed batches to appear these exams. The Board of Secondary Education AP officials had already informed to all the principals of D.Ed Colleges that Second year exams will be conducted in the month of September 2018. While communicating a copy of the time table for Special Examinations for D.Ed., 2. year scheduled to be conducted in the month of september 2018 from 10.00 A.M to 1.00 P.M. To take all necessary measures for conduct of the said Examinations. Steps shall be taken to give wide publicity to all concerned. Question Paper and OMR Sheets will be dispatched as per schedule. A responsible Officer shall be deputed to receive the confidential material with instructions to meet the Deputy Commissioner concerned by 10.00 AM on the said date. The Director has clearly indicated that the only students of AP may have followed the same methodology. The AP D.E1.Ed., 2nd year Examinations for 2016-18 batch candidates and D.Ed. once failed candidates of earlier batches are to be conducted from 11-09-2018 to 18-09-2018 and the Hall-Tickets are being hosted on this office website www.bseap.org. 🌷 తేది:10-09-2018 భారత్ బంద్ కారణంగా D.El.Ed 2వ సంవత్సరం 10వ తేదీన జరగవలసిన పరీక్ష (పేపర్-1)ను తేదీ 18-09-2018 కు వాయిదా వేస్తున్నట్టు డైరెక్టరేట్ ఆఫ్ గవర్నమెంట్ ఎగ్జామినేషన్స్, ఆంధ్రప్రదేశ్, అమరావతి వారు ప్రకటించారు. మిగిలిన పరీక్షలు ముందు ప్రకటించిన తేదీలలో యధావిధిగా జరుగుతాయి. These examinations will be held from 10.00 A.M to 1.00 P.M. The Director has clearly indicated that the only students of AP may have followed the same methodology. Candidates are advised to get D.Ed Second year hall tickets from their DIET Colleges or private elementary teacher training institutes. And also can get the hall tickets from BSE AP web Portal http://main.bseap.org/ This hall ticket is the entry pass of the examination hall, So candidates must keep their hall ticket while you are going to the examination hall.